For this weeks Waiting On Wednesday I chose The Lost by Sarah Beth Durst. Mostly this book just sounds interesting. I remember watching a movie or maybe it was a TV series that sounds sorta like this years ago and it was so good. I also haven't really read any Adult fare lately that's really grabbed my attention so I'm hoping this breaks that dry spell. Also I want to know about this knife-wielding six year old and how she comes into play with the finder. Since I'm curious, Have you heard of The Lost before? If so, suggest me another title to read while I wait for this? Oooh... It sounds like a good one!! No wonder you are waiting!! I watched the TV-show called Lost. Until it got million seasons and I got tired of it. Anyhow this one sounds really interesting. I haven't heard of it so thanks for sharing :) Great pick. The show I saw had people in a town together with no clue how to leave. I've seen Lost though and I guess it could be similar to that as well. 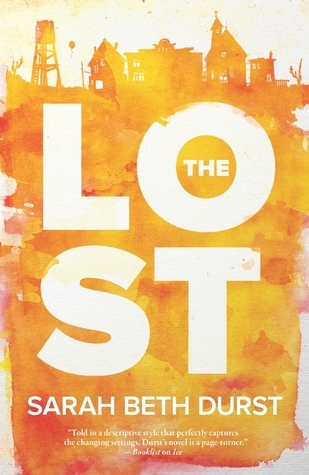 I have never heard of this book or of this author, but "The Lost" sounds really interesting. It's one of those novels which get you curious as to what the ending could be like. Yup! I think that is why I'm so drawn to it. I haven't heard of this one, but it does sound creepy-good. Thanks for sharing. WOW! This one sounds really good! I haven't heard of this one before! Thanks for sharing and great pick! That is one intense sounding book! Thanks for introducing me to the title, though I have heard of the author before. Good choice. This sounds good! Awesome pick! Thanks for stopping by my post. Just returned the love! YES!! i love sarah beth durst--she's one of my favorite authors because all the books she writes are so different from each other but they always deliver. sooooo excited for this one!! This is new to me..but Wow it sounds cool! Heh, yeah I want to know what's up with the knife-wielding six-year-old!! Definitely sounds interesting. Hopefully this can break your dry spell! I can't remember if I've seen this around but I do know Durst's name and her reputation is what draws me to this project.